Our first three locomotives. Etchings are of nickel silver, with white metal and brass castings for the details. The Burys will be 3D printed - test prints are underway to make sure that the optimum settings are used. Before being put on sale, the kits will test built a number of times to ensure that your kit goes together with the minimum of trouble. Each kit comes with comprehensive instructions with many photos to illustrate the various stages. Instructions are written by someone other than the person who designed it, so are written by someone seeing it for the first time. 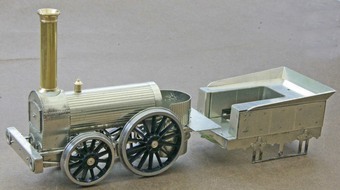 Bloomer 2-2-2 ‘As built’ McConnel version. Test build without fittings shown. ‘Expressions of Interest’ are being taken and it is probable that a second run of this locomotive will be needed! It was on show at the Guildex at Telford and drew many admiring comments! Bury 2-2-0 Passenger Engine. 3D printed in house. (To be 3D printed - Nickel Silver version shown) with Slater's wheels made to our request. 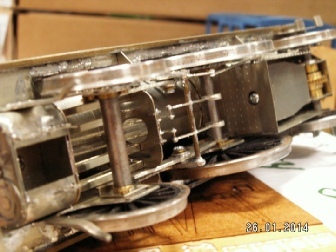 Tender driven on both axles in a nickel silver frame, with working locomotive valve gear. No photo yet. Still to test build.